MIAMI, Fla — For those of us who love to taste and follow the latest in Latino food trends, the recent South Beach Wine and Food Festival was a wonderful place to be. The chefs, cookbook authors, and television hosts who make up our food world have rolled up their knives and started to make their way home after a food, drink, and sun-fueled weekend on the beach. The festival draws on a diverse slate of international culinary celebrities, so it's no coincidence that the festival’s popularity has paralleled a rapid growth of differentiated Latin American and Spanish cuisine in the United States. We caught up with a few of our favorite Latino chefs to ask them what was next, and here are four trends worth watching — or better yet, tasting. If you grew up Latino, you might remember that a big difference between you and your American friends was the sweet side. Burnt sugar flans and sugary merengues (meringues) are delicious, but it’s not exactly apple pie and chocolate chip cookies. But there’s a new generation of Latino food entrepreneurs and pastry chefs that are only too happy to mix it up. Andrew Gonzalez of Miami's Night Owl Cookies was named one of Forbes 30 Under 30 this year and has plans to open brick and mortar shops in New York City and the West Coast. At this year’s all-American Burger Bash, Gonzalez served up his signature Ave María cookies - guava cookie dough mixed with crunchy Maria Cookies, white chocolate chips, and drizzled with cream cheese frosting — nothing short of heavenly. Another Miami favorite, Max Santiago of the Salty Donut, co-hosted the Salty, Sweet & Savory Treats event. 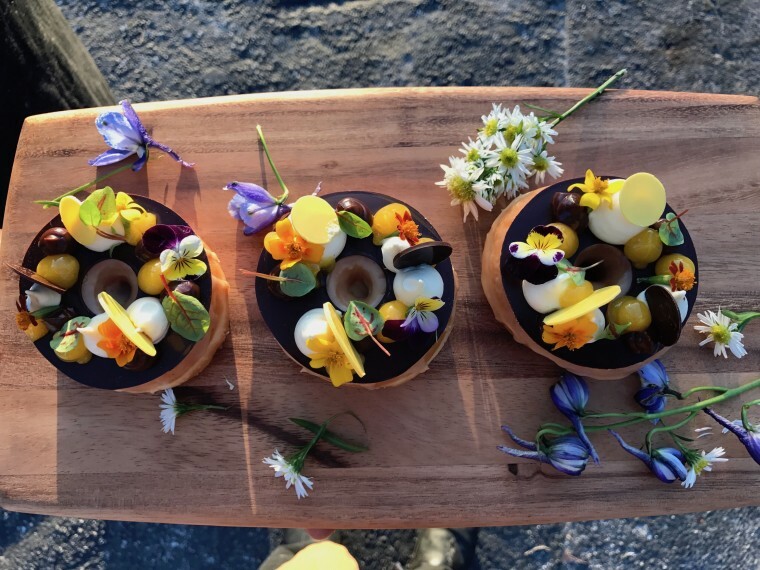 An accomplished pastry chef, he wanted to create something unique for the night and came up with a salted caramel glaze donut topped with dark chocolate, piped with chocolate ganache and passion fruit foam and gel, and sprinkled with edible blossoms. An accomplished pastry chef, Santiago’s Cuban-Colombian background shines through on his menu which currently features a tres leches donut dipped in chocolate, soaked in the traditional milk mixture, and topped with torched meringue. “I always have a little bit of my Hispanic roots in what I do,” admits Santiago. Looking ahead, Santiago sees pastry chefs serving up dessert with a shot of something stronger, like the colada espresso he uses in his salted caramel donut or the fireball whiskey, porter beer, and rumchata he uses in his own creations. It may be a touch back to the rum-soaked cakes we grew up with or it may be something new entirely. If you live in cities like Miami, New York, or San Francisco, you probably have your pick of Peruvian restaurants. But for chef Diego Oka of La Mar by Gaston Acurio, that’s only the beginning. “You’re seeing non-Peruvian chefs interested in using Peruvian ingredients, and I think it’s great,” Oka told NBC Latino. “You can see now a lot of places use Peruvian words to describe dishes like tiradito, ceviche, causa. Or they use Peruvian ingredients like ají amarillo, rocoto, ají limo.” These are all hot peppers. Oka participated at the Best of the Best event at the Fontainebleau Hotel where the young Peruvian-Japanese chef was defending his “Best Bites” title with Bacon Mochi - slow-cooked pork, topped with sesame seeds, quinoa, and Japanese pepper. It was a dish inspired by a favorite childhood snack that pushes the boundaries of what we’ve come to understand about Peruvian food. The festival brings an impressive lineup to south Florida, but Cuban food is still king in Miami. The most exalted celebrity chef can’t compete with your Abuela’s black beans. Young Cuban-American chefs are left with a choice - keep it old school or strike new ground. A traditional dish like camarones enchilados (shrimp in a tomato-based sauce) are the spark for grilled prawns, cherry bomb butter, grated lime, heirloom tomato stew and white rice cooked with lard, garlic and bay leaf and wrapped in plantain leaves. At the festival’s Bacardi on the Beach event, Beltrán served pastelitos de carne filled with head cheese topped with a fish caramel sauce and gravy mustard on the bottom. It’s a fine line for chefs when their cultural roots are as strong as the urge to innovate, but the results promise to be interesting. Chefs Alex Raij and Eder Montero, owners of New York City’s Txikito, El Quinto Pino, and the Michelin-starred La Vara — also authors of The Basque Book — remember a time when regional Spanish cuisine was a harder sell. Not that they let it stop them. While Raij predicts regional and even micro-regional Spanish cooking will continue to develop, she can see why it's taken on a new life in the United States. Raij took part in the festival’s Celebrating Spain dinner with San Francisco’s Seamus Mullen and Asheville’s Katie Button.